Columbia/Lexington road improvements consultation Wednesday! This is a big one! After a four year wait from the last attempt at addressing Waterloo's great cycling gulf, Lexington Road over the expressway is finally back on the table. 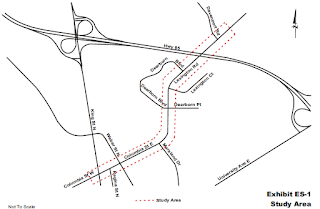 There is a public consultation for Columbia St. E and Lexington (from King to Davenport) Wednesday, June 3rd from 6:00pm to 8:00pm, at the Mennonite Brethren Church, 245 Lexington Road. If you want to ride a bike in the city of Waterloo, please consider attending. If you can't, then make a point to provide feedback when the material from the consultation goes online. The city of Waterloo currently has no bike infrastructure that crosses the expressway. It is Waterloo's great cycling gulf. 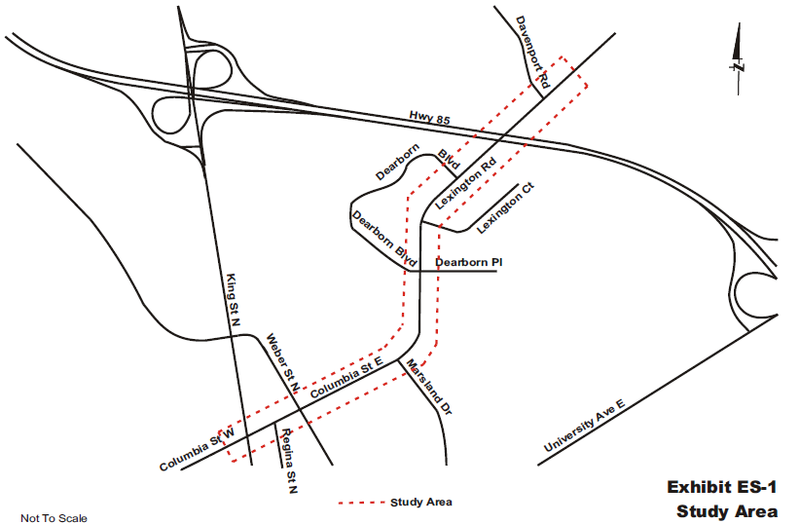 Soon, there will be a multi-use trail underneath the expressway at King St. North, which will provide some access to the Conestoga mall area. Lexington Road is the only crossing in Waterloo without on/off ramps. Lexington Road is the only crossing in Waterloo that is a city street (not a regional road). Lexington Road is the quietest, lowest-traffic crossing point in Waterloo. It also appears to be the busiest cycling crossing point of the expressway. Lexington/Columbia is an as-yet incomplete planned east-west cycling corridor. This study area is the critical missing piece. In 2011, the city consulted on potential improvements that included on-street bike lanes, and reducing Lexington to 3 lanes between Davenport and Marsland. 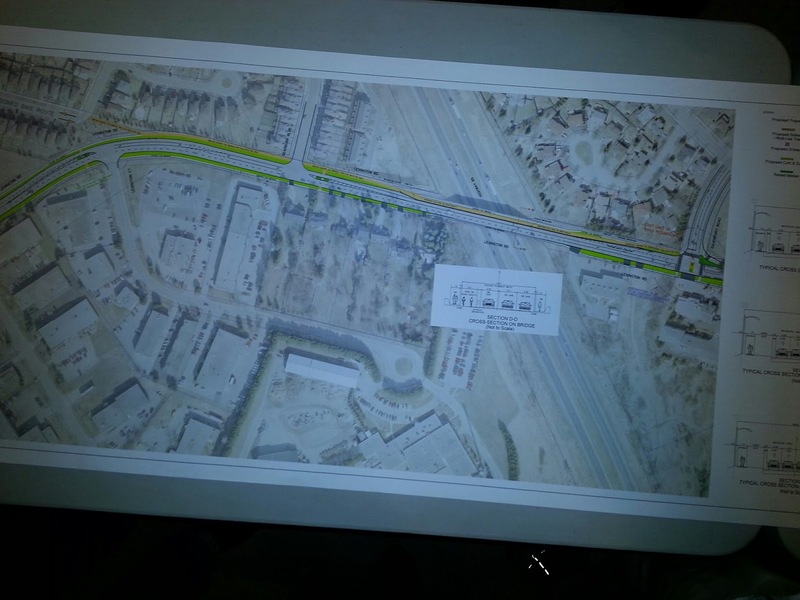 Despite the fact that the road is overbuilt for the amount of traffic it sees, the proposal drew concerns and unanswered questions from council at the time and the project was deferred in 2012. Since then, Davenport's road diet has been completed, and so have the bike lanes along Lexington east of Davenport (with some multi-use trail action coming as well.) Hillside Park and Forwell Creek Park are now part of the "Waterloop" and crossing and connectivity points are being improved. What will staff bring forward at the new consultation? I'm not sure, but it will hopefully provide a good cycling connection to the Waterloop, and reduce the speeding problem along Lexington. Could it even fill the very challenging King-Weber gap? We'll see. It will need public support! I hope to see you there.